As a kid, my mom used to cook delicious food for us everyday, and we used to love gulping it down!! Do you keep running around the house to get your kids to eat a meal? Does your little one just refuse to eat, until his favorite cartoon is tuned on the TV/Tablet ? As a mother, I am sure you feel the pain of trying to feed healthy meals to kids – especially when your child is disinterested in food, lacks appetite or is a fussy eater. Well these situations have become a household story now and moms struggle to get kids eat home made healthy meals. Realizing how helpless a mother could feel, I decided to make food appealing through the love of stories. Kids love stories as their creative minds love to live in the world of dreams of fairy tales and unexplored creations. 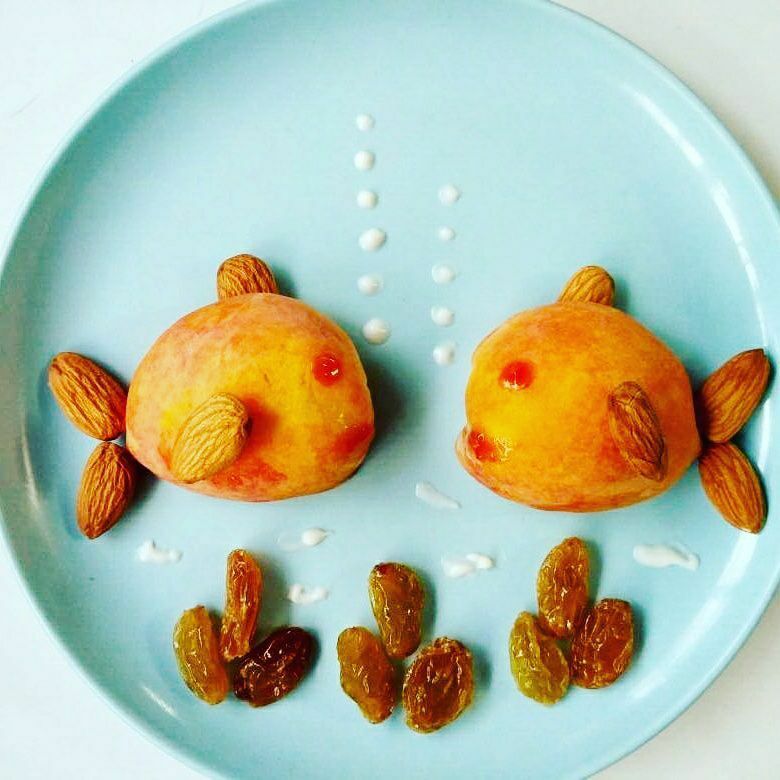 I decided to start plating food in such a visual form that got their attention, renewed their focus on food and more importantly made mealtimes fun. So as a momma, I wore my Chef hat and got my creative instincts to design and craft beautiful stories on the platter which I am sharing with you today. Do you remember this lovely game we played during our childhood? Well kids cannot not stop smiling at this cute creature & gobble the entire boiled corn seasoned with salt and pepper. Which kid does not love noodles? 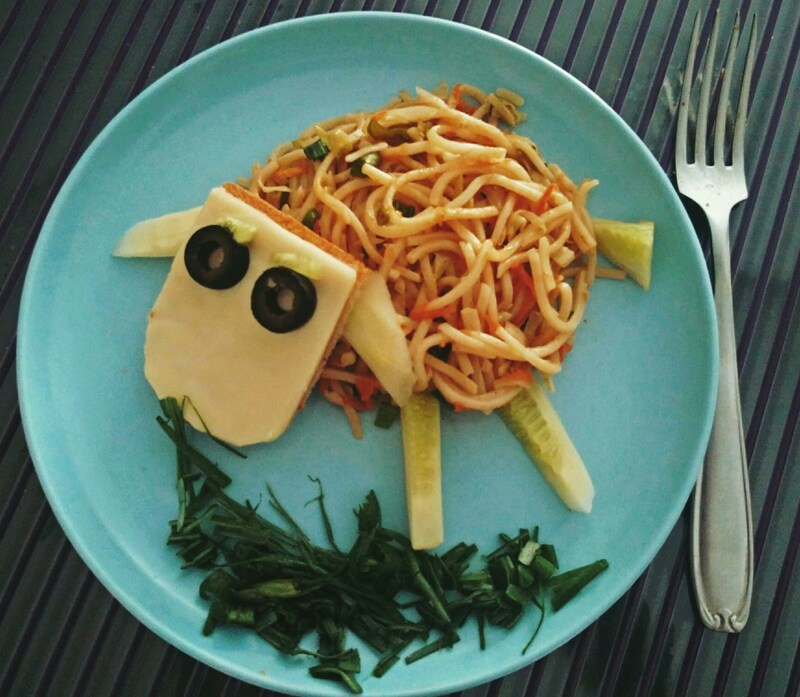 Give a different twist to this by making it even more interesting and tell a story of a sheep who loves veggies. Boil spaghetti and toss it in olive oil. Add capsicum, onion and broccoli to give a crunch feel and season it with salt and pepper. Your daughter wants a doll? No problem, just put on your momma chef hat and just make one for them like this one. 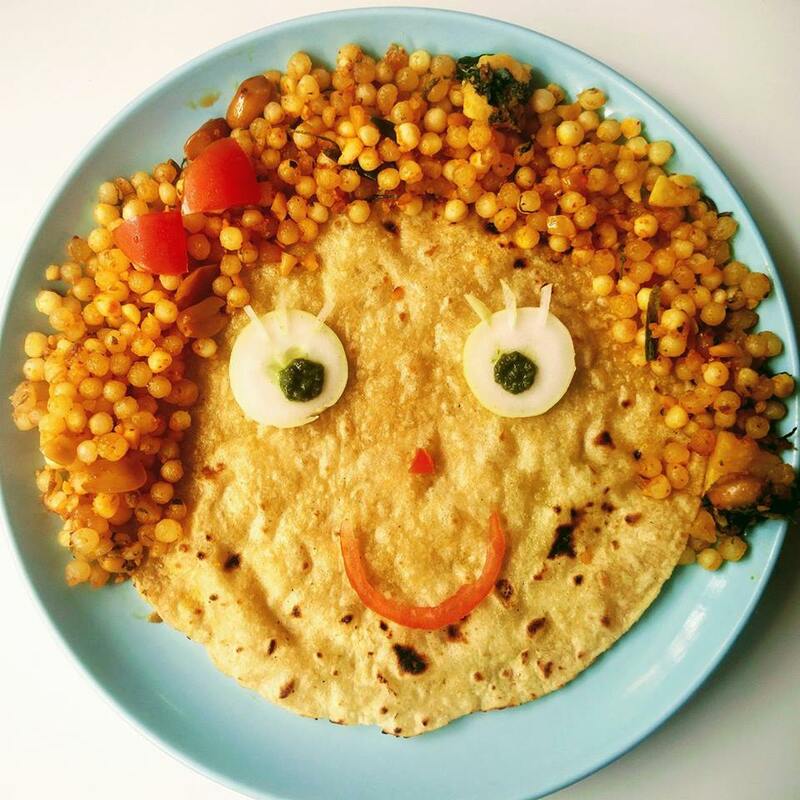 Made from healthy things like sabudana and roti – she is the healthiest doll you’ll ever see! 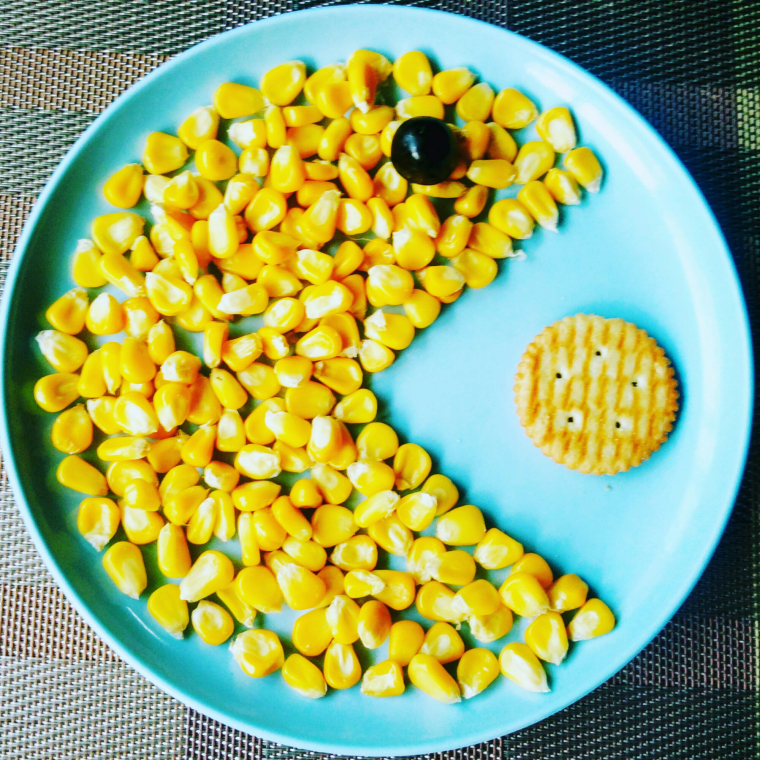 Some inspiration to the kids to eat healthy, while playing with their food. In a pan, heat the oil. Add cumin seeds, green chillies, peanuts and boiled potato. Saute it for 2-3 mins. Add the soaked sabudana, salt, red chilli powder, turmeric and cook the sabudana for 3-4 mins. Lastly add the crushed peanuts and give it a stir ensuring sabudana don’t stick to the vessel. Getting kids to love fruits is no easy task. 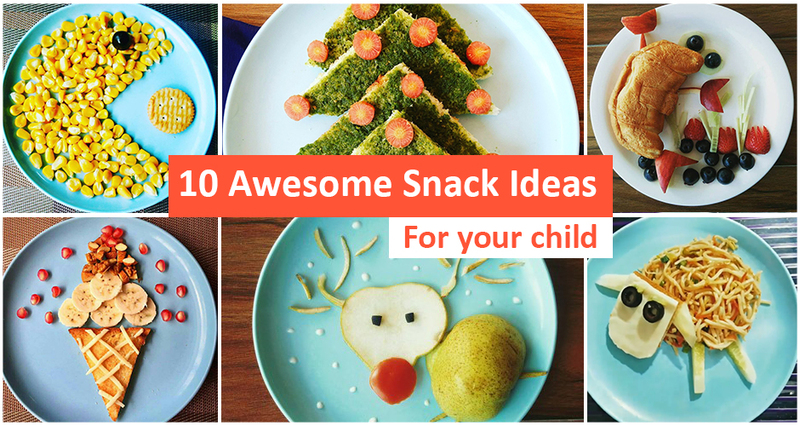 However, if you make it a visual treat for your child’s eyes, they will eat them all, and at the same time and have a smile on their faces. 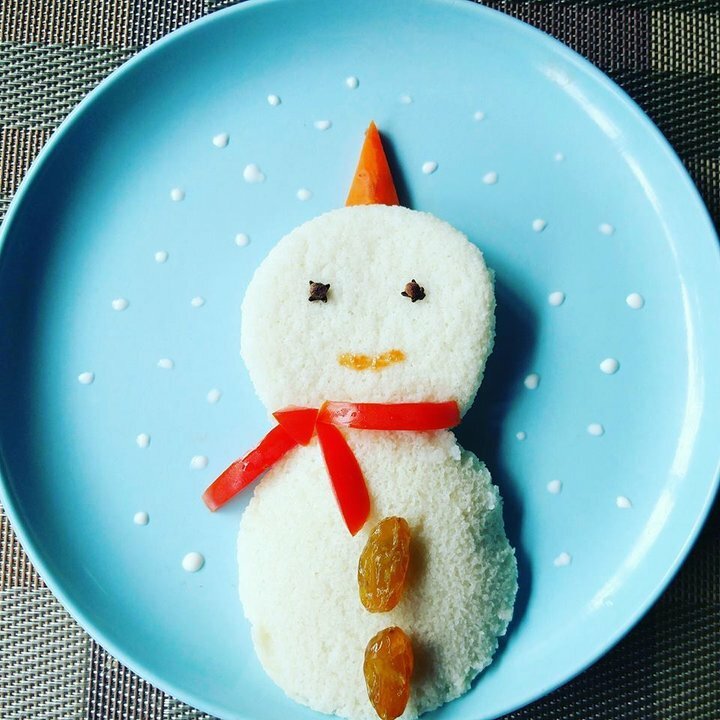 Did you know Mr. Snowman is a South Indian. Confused, right ?? Well these hot piping idli’s will surely make him fall in love with South India! 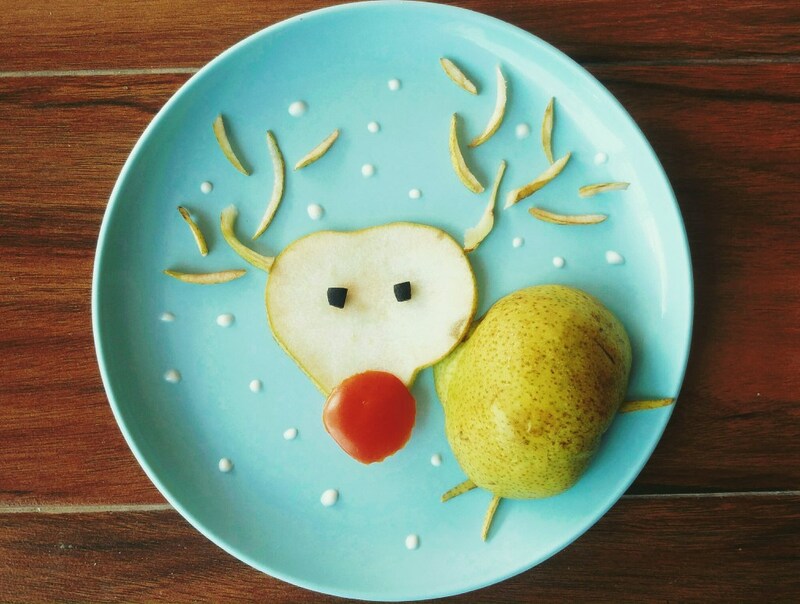 A cute little animal is running on your child’s plate, will he be able to catch it? This fruit is available throughout the year and will surely be loved by kids for it’s sweet taste. Well this is just an attempt to make one of the world’s most popular cartoon characters – The Spongebob. 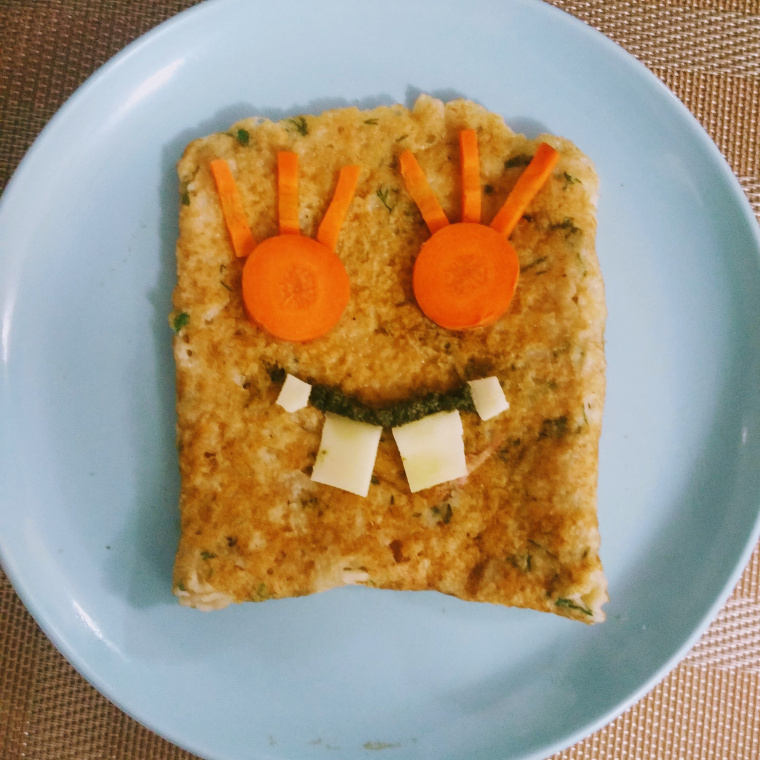 While I may have not have got the real character on the plate – I still got some oats dosa into my kiddo’s little stomach with giggles all around. Combine all the above ingredients together and leave it for 20 mins. After the set time check the consistency of the batter and start preparing the dosa on the hot plate. 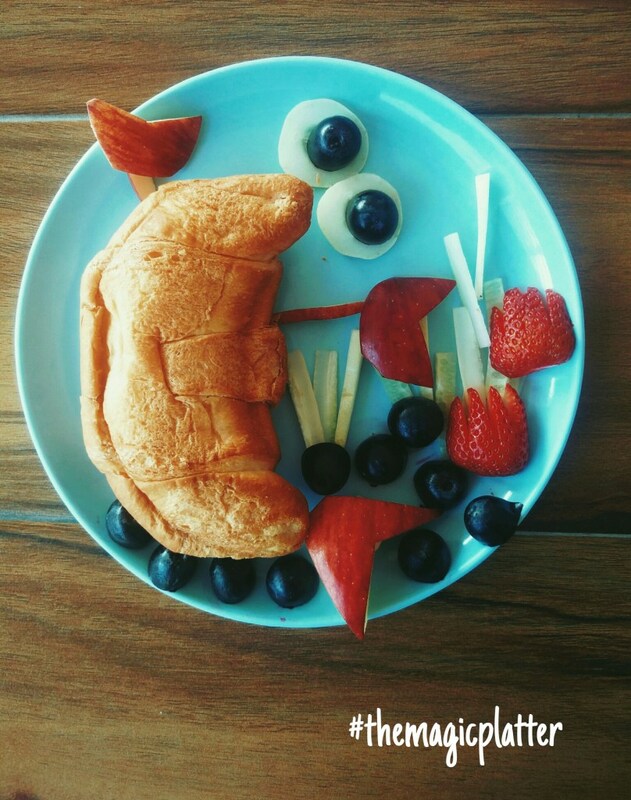 Making a complete english breakfast for kids with this weird looking lobster made from croissant & some assorted fruits. Well , where is the water for the lobster ?? Hmm…The kids gulped the glass of milk to eat this tiny creature. Mission accomplished. You’ll love this festival having on your child’s plate! 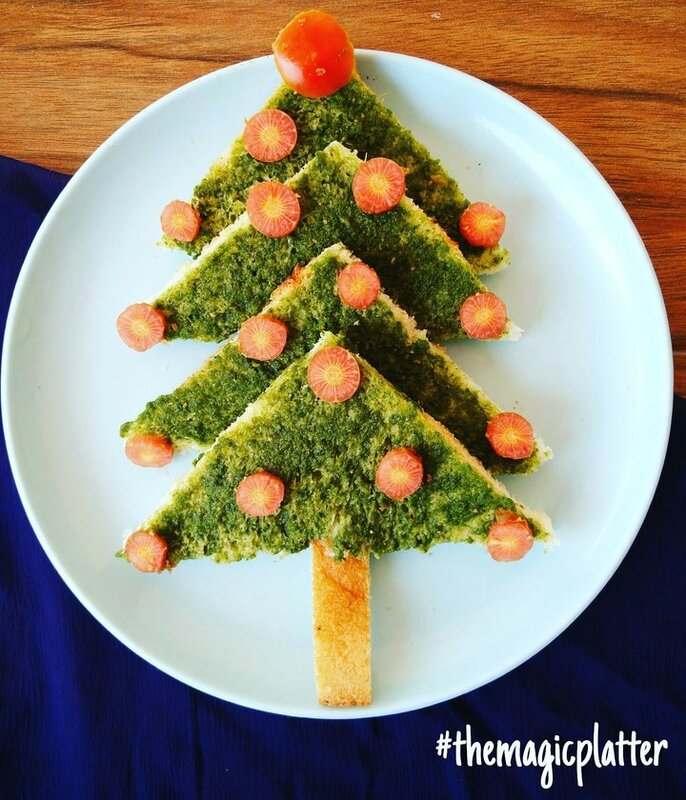 This Christmas tree is made from chutney sandwich and carrots – all healthy and delicious ingredients – simply making it a win-win for both kids and mommies. Which kid does not love Ice-Cream? You won’t need to trick them to eat this dish! 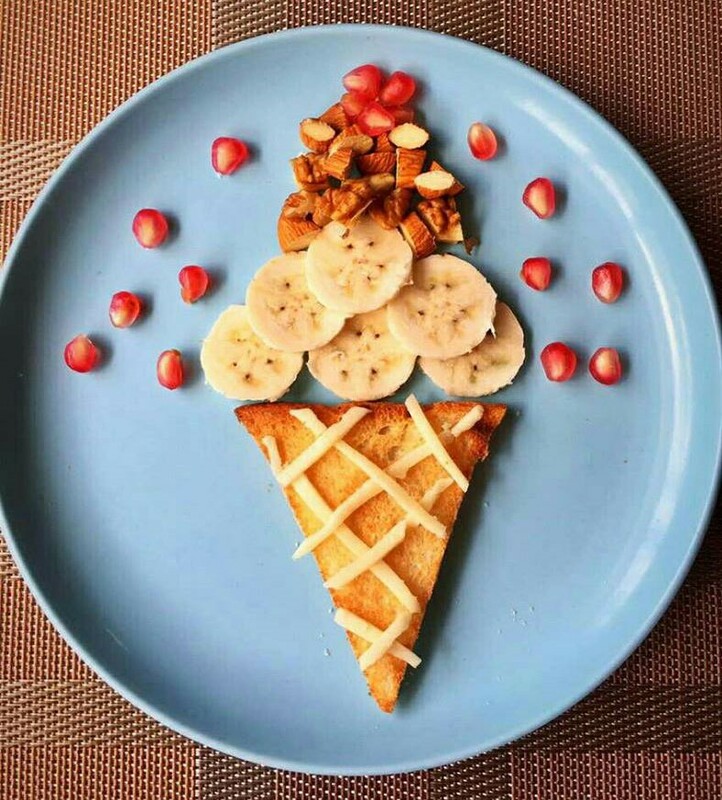 Let them help you make this – from bread and cheese, bananas, walnuts and pomegranates – all healthy ingredients – together making it a lip smacking treat for your child. So mommies, say goodbye to your worries about “my child doesn’t eat” by trying out these various platings. All you have to do is wear your creative hat and surprise your little munchkins through story telling sessions at their meal time. And in case you like these platters or have some suggestions, do share it with me. Hoping to hear from you mommies.